If you’re a regular Facebook user, then you have probably already tried out the new Reactions feature which, instead of allowing you to simply ‘like’ a post, gives you the option of selecting one of five brand new emojis as well. By simply holding down the like button on a mobile phone (or hovering over it on a desktop), you are able to select either a ‘Like’, ‘Love’, ‘Haha’, ‘Wow’ ‘Sad’ or ‘Angry’ emoji depending on your feeling towards that particular post. So why have Facebook made this change? Well, it’s mostly down to the users, and partly to offer companies more insight into their audience. Facebook users found that, whilst the like feature was great for showing support on positive posts such as an engagement, a new job or a graduation, they felt uncomfortable liking a post which covered a sad or difficult topic. Many were calling for a ‘dislike’ button to alleviate this problem, however in order to steer clear of negativity on posts, Facebook came up with the Reactions feature instead. 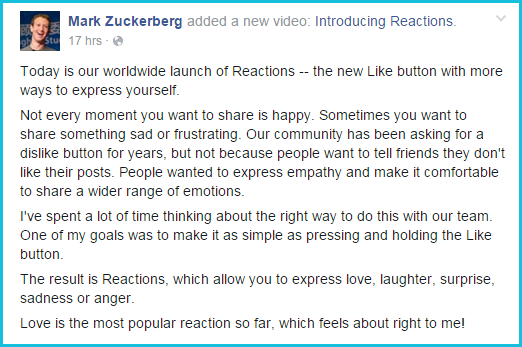 So whilst this new feature is great for Facebook users, what do Reactions mean for marketers? Shares, comments and likes are measured religiously in social media marketing, so that businesses can assess what kind of posts work best in terms of audience engagement. What does it mean now that there are five new elements to consider? On the one hand, Facebook Reactions can provide a highly beneficial new perspective for you (as a marketer). Not only do they give you the opportunity to collect more data about your Facebook followers, but you can now understand how your audience ‘feel’ about specific posts and themes. In being able to better understand your followers Reactions, you will also be able to communicate more effectively with potential customers and brand advocates, and establish a stronger business-to-customer relationship. For example, if you post a comical video, and receive 100 ‘Haha’ Reactions, you will immediately know that your consumers appreciate funny content. It’s a fantastic way to test out what triggers your audience’s emotions, so that you can learn what makes them tick, and create content that will instantly pull them in and further build that bond you’re establishing with them. In terms of a return on investment, the Reactions feature is another helpful tool in the bigger picture; a way to learn more about your audience so that when it comes to pushing products, promoting your brand and advertising through Facebook, you have a better idea of what your audience truly want to interact with. Before you spend the money on Facebook ads, you’ll have a lot more post data to analyse via Facebook Insights, and this can ensure that you create the right advertising campaign for your audience, and more importantly, see positive results from the get-go. Unfortunately, Facebook haven’t yet provided a way for you, as marketers, to separate and analyse these Reactions when exporting data via Insight. Instead, Insight simply groups together all of the Reactions in a single tally. This makes it difficult for you to differentiate the kinds of Reactions that you’re receiving. There could be an update soon, but as of yet, we can’t see how you can gain access to this Reaction detail and easily digest it. You do have the option of sifting through individual posts and manually tallying the numbers of each Reaction, but this method of data collection is both time-consuming and impractical – both of which you probably can’t afford. Despite the inefficiency in measuring Reactions data, the new Facebook feature is still fundamentally very useful and positive – for both users and marketers. Users are given more freedom in how they wish to express themselves on Facebook, and marketers are able to understand their audiences a little better. 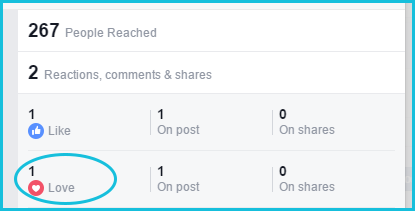 If Facebook now make this data easier to export and digest, it will be far more beneficial for marketers.